Wildlife fences are constructed for lots of reasons, including having them killed by cars (and people along with them) to prevent the spread of disease and to protect small small populations of threatened species. Near more populated areas, the concern is different; predatory animals will wantonly kill livestock and ruin crops, a few threaten human lives. Separating people and wildlife by fencing is a mutually beneficial way to avoid detrimental effects but a paper in Science, clearly written by people who clearly do not live near bears, wolves or mountain lions, argues it is a last resort. They argue that rather than preserving endangered species, which has been the reason environmentalists wanted wildlife preserves, fencing makes small and isolated populations more prone to extinction. Their vision of an "ecological meltdown" is vague, and heavily assumption-based, but worth considered. Basically they believe large, dangerous predators should be controlled in ways other than fences. Ecological domino effect based on assumptions by advocates is not a great argument but a valid one is that fences may not achieve their specific aims. Construction is expensive and there may not be proper fence design, location, construction, and maintenance. "In some parts of the world, fencing is part of the culture of wildlife conservation – it's assumed that all wildlife areas have to be fenced. But fencing profoundly alters ecosystems, and can cause some species to disappear. We're asking that conservationists as well as other sectoral interests carefully weigh up the biodiversity costs and benefits of new and existing fences," said Zoological Society of London's Rosie Woodroffe, lead author of the study. Co-author Simon Hedges of the Wildlife Conservation Society says, "A variety of alternative approaches – including better animal husbandry, community-based crop-guarding, insurance schemes, and wildlife-sensitive land-use planning – can be used to mitigate conﬂicts between people and wildlife without the need for fencing. WCS projects working with local people and government agencies have shown that human–elephant conflict can be dramatically reduced without using fences in countries as different as Indonesia and Tanzania." 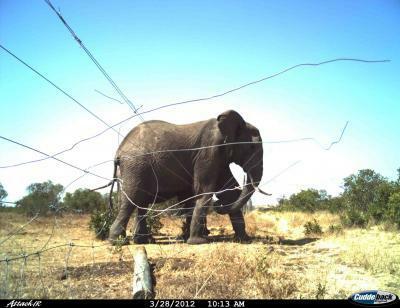 Co-author Sarah Durant said, "An increased awareness of the damage caused by fencing is leading to movements to remove fences instead of building more. Increasingly, fencing is seen as backwards step in conservation." That's going to be a roadblock to better approaches because conservationists were the ones who wanted the fences put up in the first place. If these fences are now believed to have had devastating environmental effects it is going to be very difficult to get policymakers to listen to the same conservation groups without wondering if they are just guessing. Science may have an answer where environmentalism does not, at least for some of the issues. It is increasingly recognized that a combination of improved testing, vaccination, and standardized approaches to meat preparation can prevent spread of diseases without the need to separate cattle from wildlife by fencing. They're still going to get shot if they try to eat a cow but that is a separate problem. It's odd that conservationists who lobbied for fencing now say that wildlife mobility and landscape connectivity are more important.